Don't go to Istanbul. Or if you do, stay for no more than three days, go only where tourists go, eat only where tourists eat and learn nothing about the city's history. Anything more will result in Istanbul becoming for you, as it has for me, something like Ithaca in Homer's Odyssey. You'll think about it wherever you go. You'll compare everything to it and nothing will ever measure up again. In short, you'll be ruined. After that overture, you might think that I live in a miserable place. On the contrary, I spend most of the year in Arizona, a U.S. state famed for the beauty of its deserts, canyons and mountains. In winter, Arizona's climate is heavenly. Despite the privilege of living in such a desirable region, however, I think of nothing but how many months, weeks or days remain until I can get back to Istanbul. Every time my husband and I go out for a rare Saturday night dinner, we have the same conversation on the way home. We say that the food was OK, but in Istanbul we would have eaten much better. We enumerate the places that we could have gone: Imroz in the Fish Bazaar, the Circassian restaurant Fıccın, Madam Despina's meyhane or Çiya on the Asian side. We salivate when we imagine what we could have eaten: grilled Black Sea fish, stewed lamb, stuffed quince, artichokes with dill, white beans in tomato sauce, simple dishes made with fresh ingredients that you just can't find in the states. Moreover, even if we haven't been to one of our favorites in a year, they still remember us, welcome us like an old friend, and even recall our preferences. The annoying U.S. greeting "have you dined with us before?" is an insult in any reputable Istanbul establishment. Of all days of the week, however, the one that makes me miss Istanbul most is Sunday. There is no place that I enjoy going to church more than Istanbul. The Ecumenical Patriarchate, spiritual leader of the planet's Orthodox Christians, has had its seat in Istanbul since the fourth century A.D. A vibrant Orthodox Christian community continued living in the city after the fall of Byzantium, throughout the Ottoman era, and well into the 20th century. Although Istanbul's Orthodox Christians now amount to only a few thousand, hundreds of Orthodox churches, chapels, and holy springs remain from the days when nearly half of the city's population was Christian. Haunting liturgies are still celebrated in our churches every Sunday morning. I know that prayer should be the same everywhere, but for me it's different in Istanbul. The churches seem alive, like people, even when they are almost empty. The chanting is more resonant than elsewhere. The incense smells more sweetly. I love being, if only for the summer, one more member of an ancient community that still believes in miracles and refuses to disappear, despite prognostications of imminent extinction. After church, there's tea. You can go to any gourmet teahouse in Arizona or the entire U.S. and you will never taste tea as soul-warming as that of Istanbul. It's not just that Turkey has the best black tea anywhere. It's drinking it in Istanbul, whether you're on a ferry to the Asian side or one of the Prince's Islands, with seagulls swooping and diving all around, whether you're on a terrace overlooking the Golden Horn and the minarets of the Old City, whether you're in the gardens above Taksim, or whether you're hanging out in a church salon with elderly friends who have been through the ringer and yet keep chatting, laughing, telling stories, singing rembetiko, and walking across the city as if they were still in their teens. 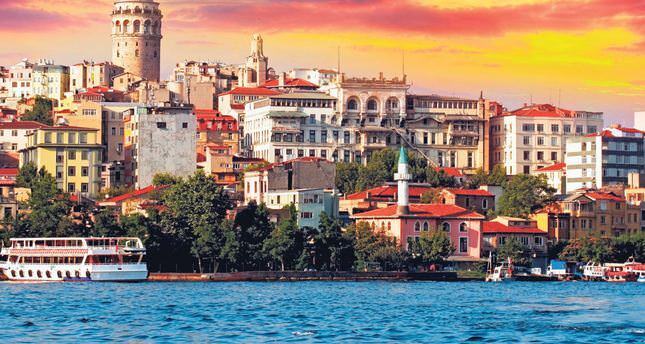 A final warning for history buffs: Istanbul has ancient ruins, Byzantine walls, Ottoman mosques, Bosporus mansions, archaeological museums, stately palaces, and 19th century houses with charming bay windows. If you must come to Istanbul, be sure to buy your return ticket in advance. Otherwise, you may never leave. Even if you spend your entire life here, there will always be more to discover because the city is infinite. And when you've gone, you'll look at those quaint buildings on the heritage registries of American towns and say, "Built in 1921? 1946? You think that's historical?" Dear Istanbul, you've ruined so many things for me. Yet I'm not wearing rose-colored glasses. I know that you have the potentially fatal problems of the world's largest cities: extreme overpopulation, water shortage, hyperconsumption and prize-winning levels of sulfur dioxide air pollution. Knowing all this, however, I am still counting the days until I return. The toponym Istanbul is a combination of three Greek words:    (is tin Poli). English translation: to the city. That means that when you know Istanbul and you find yourself outside it, there is only one direction to go: back to the city. So take my advice: never go, or at least never stay. If you do, not only will it always pull you back, but it will ruin you forever.